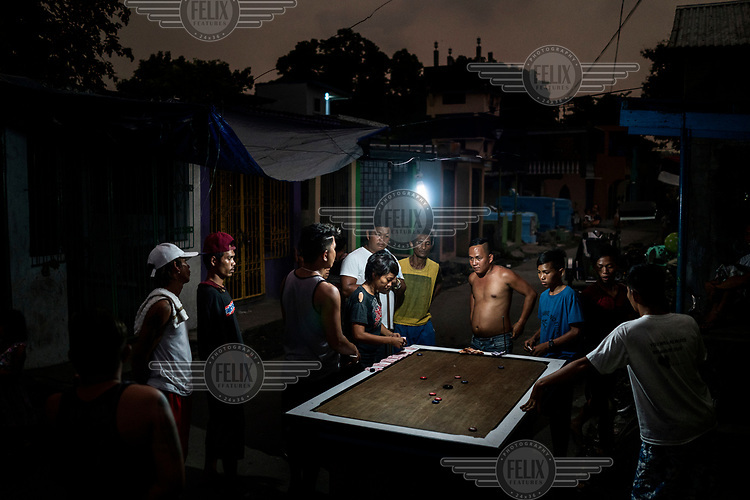 Residents playing a game based on pool using a homemade table at Manila North Cemetery. Manila North Cemetery is home to thousands of 'informal settlers' who have built shacks using in and around the mausoleums, crypts and tombs. In comparison to the city's dangerous shantytowns the cemetery is relatively quiet and safe. However, water must be collected from a few public wells and the electricity supply is erratic, usually stolen from mains cables. In the summer the sweltering heat drives people to sleep outside often on top of the tombs. Some of the residents live in the crypts and mausoleums of wealthy families, who pay them a stipend to clean and watch over them. Others make a living carving headstones or selling candles to visitors and helping out at funerals as the daily life of the cemetery goes on around the people who live there.